Tamar has extensive experience in developing and implementing retrofitted hydro power solutions designed to exploit the potential energy and improve the efficiency of existing utilities and water systems. Over the past 40 years, Tamar has installed many thousands of kW of hydro electric power in existing irrigation schemes, waste water systems, storage dams and into existing water utility infrastructure. With the rising costs of power, more and more organisations are searching for ways to improve efficiency and reduce operating costs. Tamar Hydro offers viable turbine power plant options in a wide range of circumstances. We can provide a cost effective solution to achieve the best efficiency and can significantly reduce the carbon footprint of systems by extracting the potential energy that is otherwise wasted. 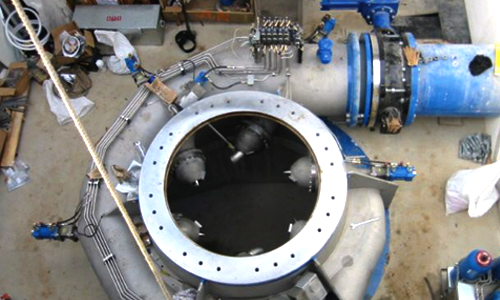 Tamar can design and manufacture mini hydro systems to replace pressure reducing valves, which not only generate electricity, but also minimise the noise pollution created by dissipating valves. Tamar’s experienced hydroelectric consulting engineers can conduct site audits and evaluations to determine the potential power available in existing systems and can provide advice in regards to the best possible method of exploiting these resources.